​Chelsea may be set to rival Real Madrid and Manchester United in the race to appoint Tottenham boss Mauricio Pochettino as their next manager. Both Madrid and United are currently under the leadership of interim managers, with Santiago Solari having succeeded Julen Lopetegui at the Bernabeu, whilst Ole Gunnar Solskjaer has eased into life at Old Trafford after replacing the sacked Jose Mourinho. Both former players have steadied the ship at their respective clubs but are expected to face stiff competition to keep the job in the summer. ​Spurs coach Pochettino is the name most regularly linked with both posts, however, according to ​The Express, ​Chelsea could also be interested in the Argentine. Maurizio Sarri was only appointed as head coach at Stamford Bridge last summer, replacing compatriot Antonio Conte in west London. However, despite making a strong start to the campaign, the Italian has endured a tough recent run at the helm of the Blues. It is suggested that Sarri has been warned by the club’s owner Roman Abramovich that failure to qualify for next season’s Champions League could cost the former ​Napoli boss his job at Stamford Bridge. "We can improve, change mentality and play our football." 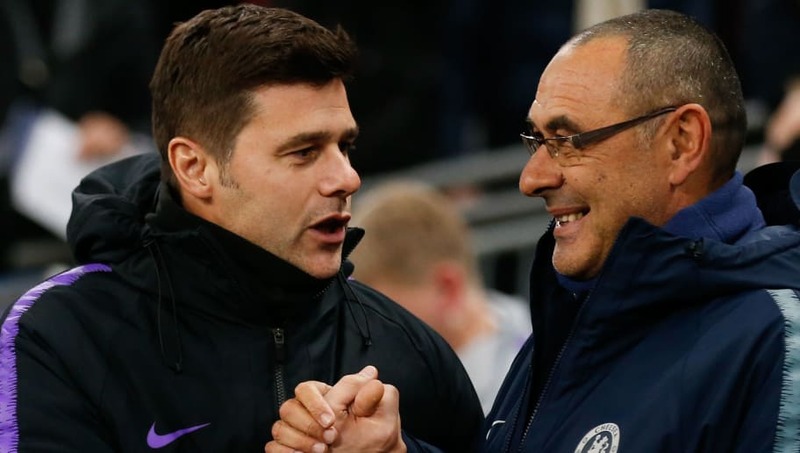 Abramovich apparently holds an interest in Tottenham boss Pochettino, who has led his Spurs side to a surprising title challenge this term, though it is said that the Chelsea owner is aware of Daniel Levy’s unwillingness to let Pochettino leave the north London side. Pochettino only signed fresh terms last May, with four years still to run on his contract with Spurs, and it is suggested that any interested club would have to pay in excess of £50m to prise the 46-year-old away. A thumping 5-0 win over ​Huddersfield on Saturday was enough to restore Chelsea to fourth place in the Premier League, but the 4-0 defeat away to ​Bournemouth in midweek was a clear sign that the Italian is struggling to impose his coaching methods with the Blues. Chelsea will look to continue their bid for a top four finish as they travel to face champions ​Manchester City at the Etihad Stadium next Sunday.